I finished up all those hair accessories that I posted about last week. Now I’m on the rather tedious step of getting them all photographed. While I’d much rather be creating, this part of the process is not entirely awful. As I crop and edit the photos, I see my work with fresh eyes and find new details. This one’s my favorite … at least for today. 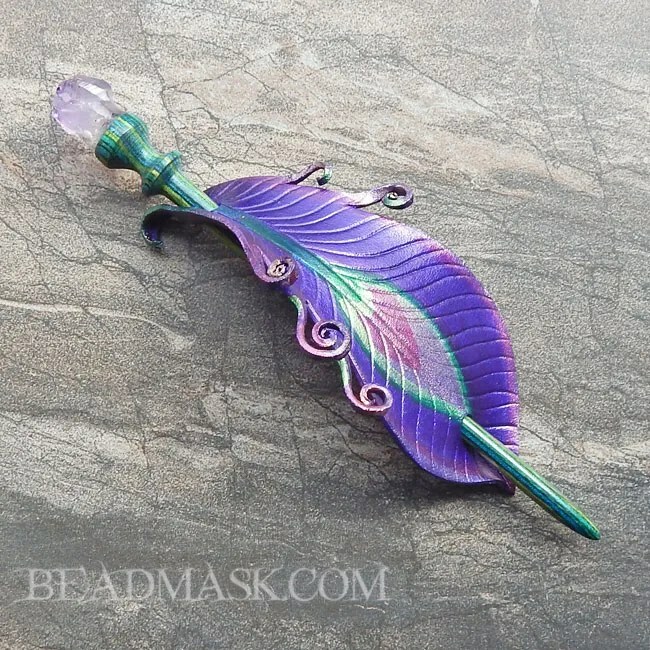 A fantastical peacock feather in shimmering purples and greens, with an artisan crafted wood stick topped with a genuine amethyst point. Very magical, if I do say so myself. You can find it here. New Hair Toys, Coming Soon! These photos show some of the leather hair accessories that I’ve been working on recently. They’re mostly finished, they just need findings (hair sticks, French clips, or alligator clips). I’ll be finishing these up in the week(s) ahead, and getting them all photographed and listed here on the website. At this point, the bulk of the work is done, but it can still take a while to get the finishing touches done and to get them all photographed. If you spot one that you love, but you don’t see it listed yet, just drop me a line (either via my contact form, or in the messages below). 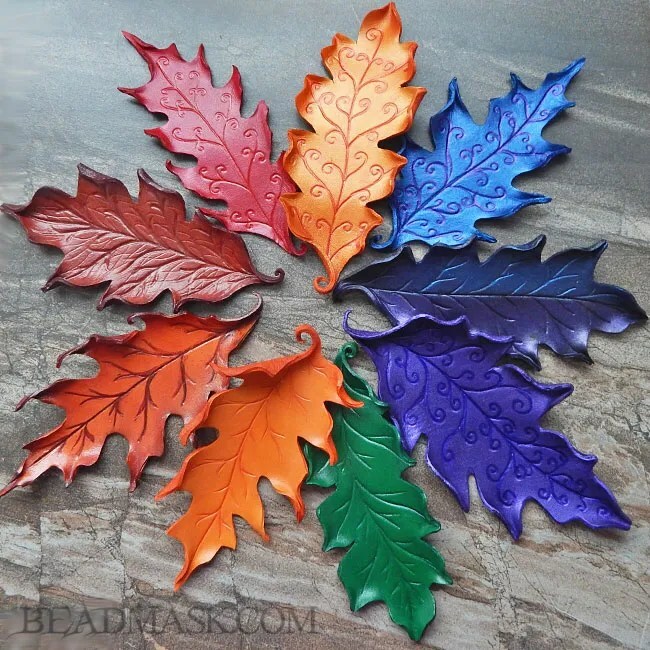 At this time, I have a variety of leather oak leaves, as well as peacock feathers and birch leaves. This is the 6th version in this series of masks since 2009. Each one is a bit different, but they’re all made from the same pattern. 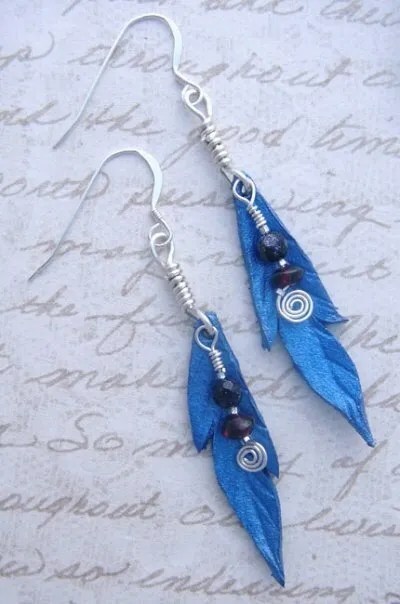 This one is a gorgeous electric blue, accented with peacock, parrot and pheasant feathers in shades of blue, green and bronze. 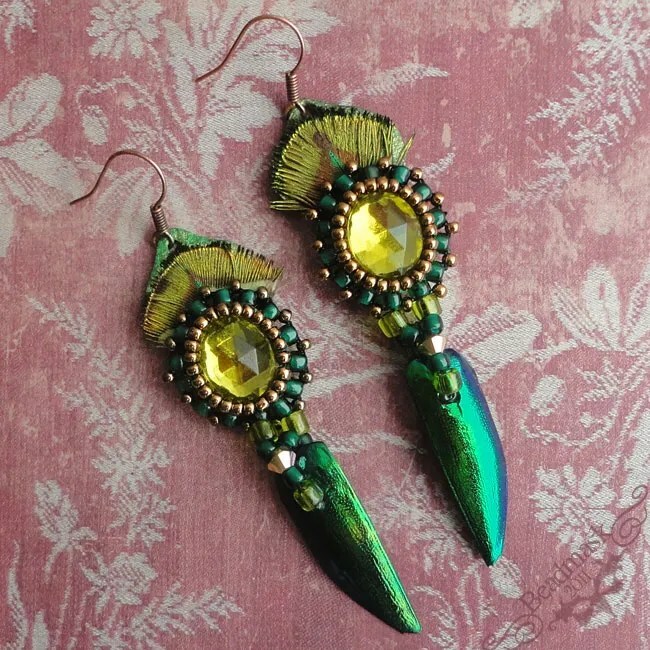 At the forehead is a shimmering green beetle wing, set in a bezel of glass seed beads. What’s with all the peacock feathers? 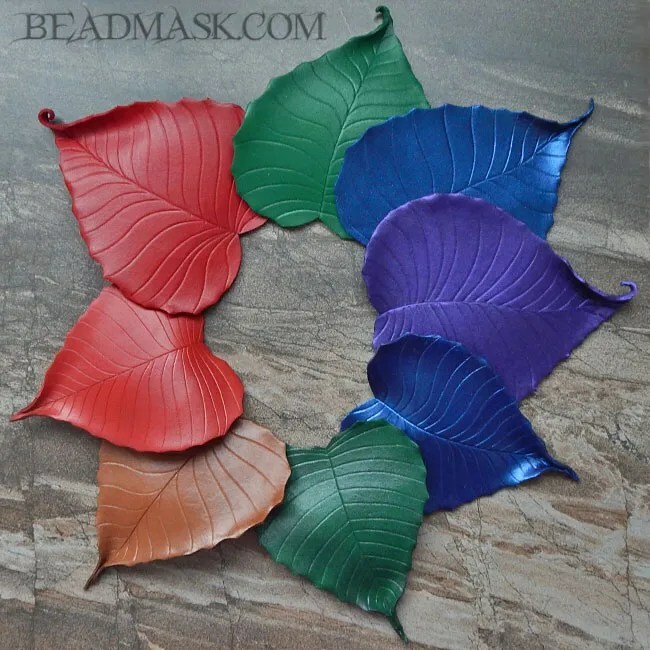 My leather peacock feather designs are quite popular, which pleases me to no end. 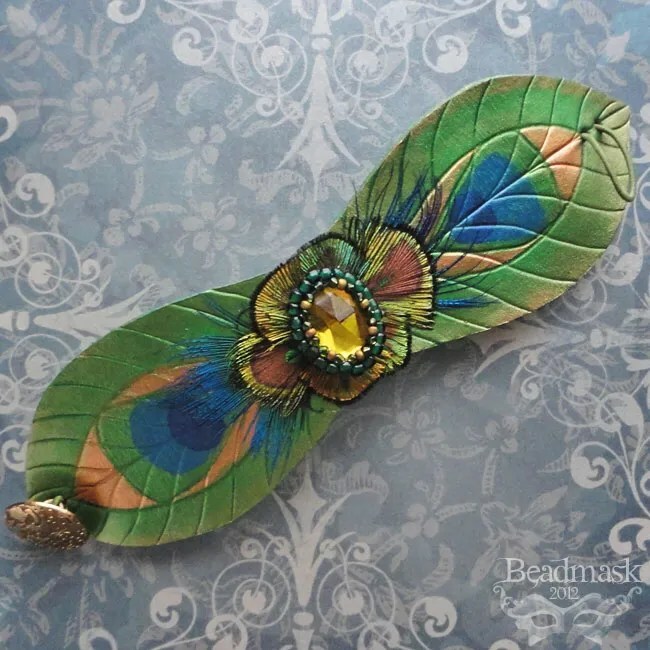 I love making them, and I continue to find new and different variations on the theme… peacock feather hair slides, barrettes, brooches, cuffs, collars, pendants, masks and more. 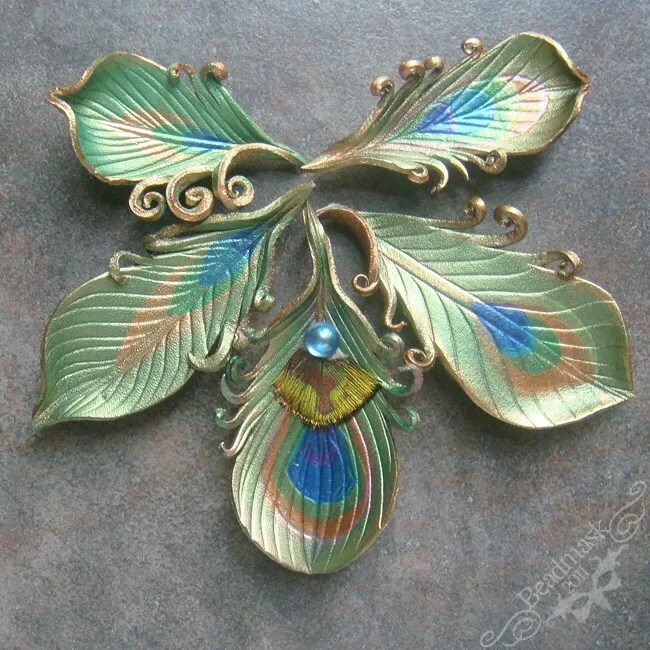 Sometimes I create them in “traditional” peacock greens and bronzes, other times, I use fantasy colors. These pieces are dear to me; beyond the simple fact that I enjoy making them, they represent something special. Back in 2010 when I was working on the first set, an old friend was battling cancer. Odd as it may sound, my peacock feathers are about her. Jackie was a wise gardener as well as a major history and science geek. She was also an avid SCA enthusiast for well over 20 years. In case you’re not familiar with the SCA, it’s “an international organization dedicated to researching and re-creating the arts and skills of pre-17th-century Europe”. Participants study and re-enact the skills and lifestyle of that time period, often creating fictional personas for these events. Jackie’s alter ego was Mahala de Sorbonne, and her argent (crest? sigil? – forgive me SCA peeps, I’m not well versed in this stuff – was “A peacock proper in his pride”. During her many years in the SCA, she researched passionately and shared her immense knowledge with others. She achieved the rank of baroness and cardinal, but most importantly, she was an integral part of a community of creative and interesting people that she loved with all her heart. The love that she felt for this community was certainly reciprocated; this was always evident, but especially so when she was diagnosed with cancer. Her friends banded together to support her and her husband in myriad ways, ranging from practical tasks like cooking and cleaning, to the more emotional work of raising her spirits. I could tell when she had recently visited with her SCA friends, because she was significantly happier and more alive afterward. Unfortunately, she did not beat her cancer, but I think she was incredibly fortunate to die at home, surrounded by her husband, candlelight, and this close circle of friends. When my time comes, I can only hope to be so loved. My first batch of peacock pins and barrettes was distributed at her wake. I asked her husband to give them to some of the women who had helped her most, but I suspect that I did not make enough to acknowledge the many people who stood by her. 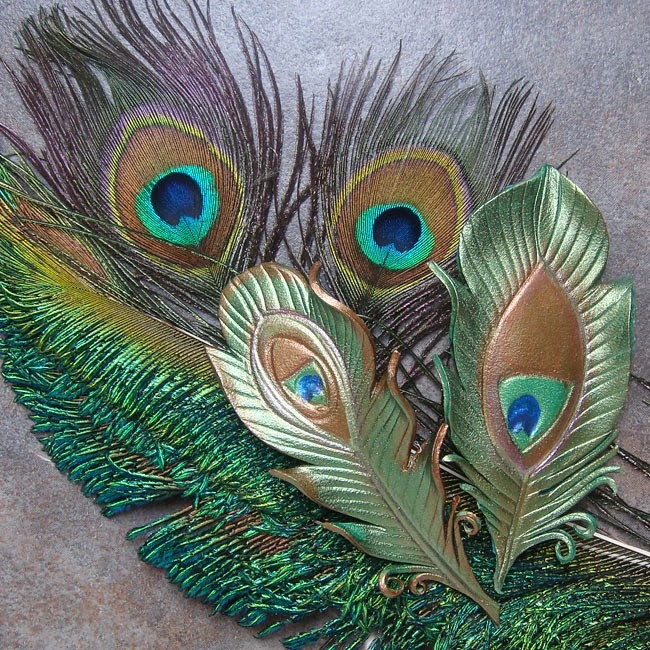 (On that note, if any of you happen to read this, and would like one of my peacock pins, just drop me a line. Tell me something about Mahala so that I know that you’re legit, and send me your mailing address. I will gladly send you a pin.). Since that time, I have worked to honor her memory by donating a portion of every peacock sale to the Seattle Cancer Care Alliance or the Fred Hutchinson Cancer Research Center. She’s been on my mind lately — maybe because its around the time that I usually make my annual donation, or maybe it’s because life in our new home brings up many questions about dogs, horses and gardening. These topics were among her (many!) areas of expertise, and I really wish that I could pick her brain. These things make me miss her, and remind me that I was fortunate to know her. who ask why I’m obsessed with peacock feathers. As you can see, I’m not actually “obsessed” with them – I simply enjoy their beauty and the special association that they have for me. They remind me of an old friend, and about the powerful healing properties of love and connection. 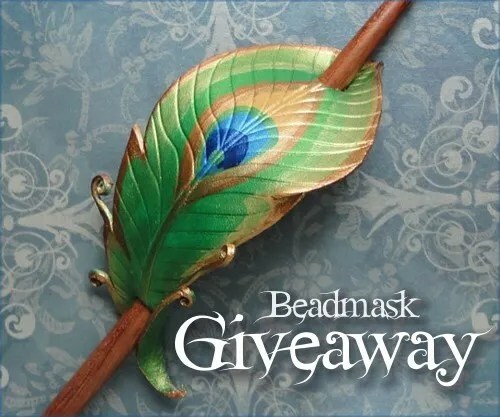 The lovely Aquariann is hosting a giveaway for one of my peacock feather hair slides. These pieces are hand cut from high quality tooling leather, and then carved, shaped and painted. The colors are shimmering hues of green, bronze, turquoise and cobalt. I cut these pieces freehand, so each one is a bit different. The winner will receive a hand crafted hair toy very similar to the one shown, but the stick length and hole spacing will be tailored to their preference. Please head on over to her blog to enter before May 30th, 2012. 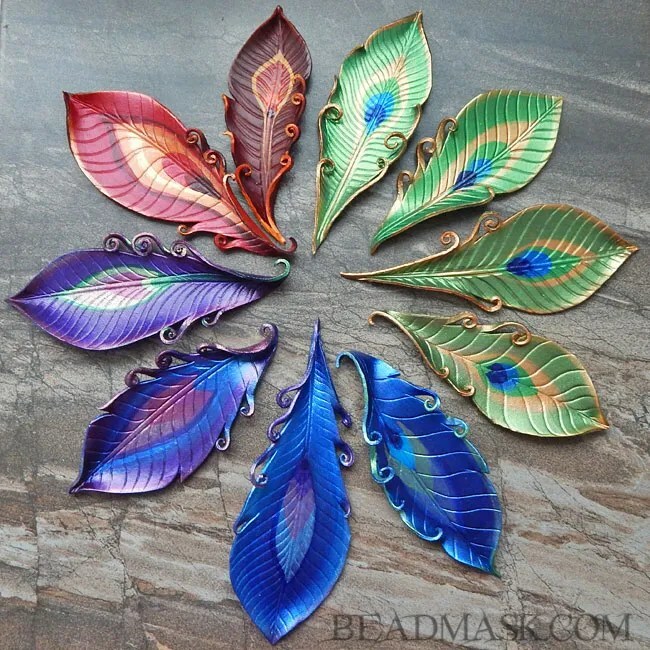 I’m still having loads of fun with my leather peacock feather designs. Shown here are two new leather cuff bracelets featuring carved peacock feather designs with real body feather accents. They’re embellished with vintage glass cabochons and fine seed beadwork. The one to the left is done in an emerald green, and the overall design is a tad simpler. The one below is done in a shimmering olive green, with more elaborate shaping and beadwork. Both close with button loop closures, so they’ll stretch from about 6.5″ – 7.5″. There are a few more peacock designs on my work table right now. I’m excited to see how they’ll turn out. Hopefully I can squeeze in some studio time and get them finished up soon! 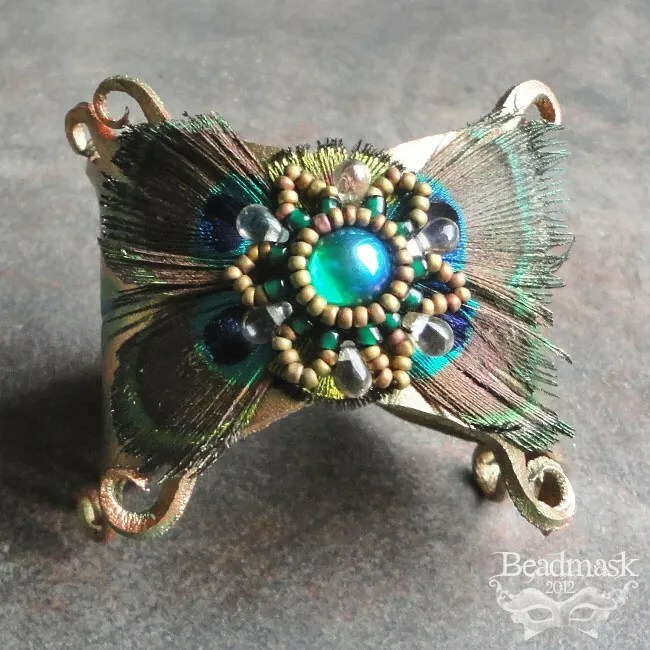 As with all of my peacock themed items, a portion of every sale will be donated to the Seattle Cancer Care Alliance in memory of Mahala. I’m not doing the “inspiration Wednesday” thing today, cause I’m just not feeling it at the moment*. Instead, I’d like to reflect on some design progress that a friend recently pointed out. 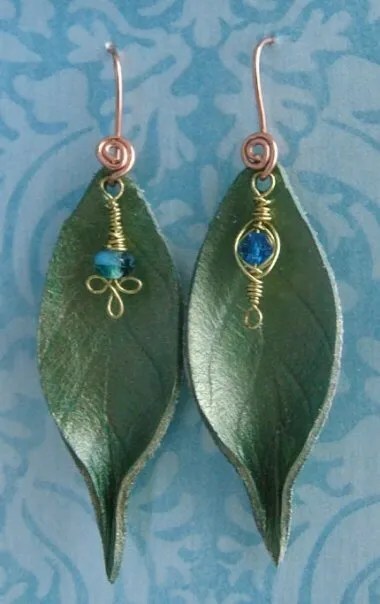 In 2009, I started playing with a new (to me) earring style that makes use of some of my smaller leather scraps. 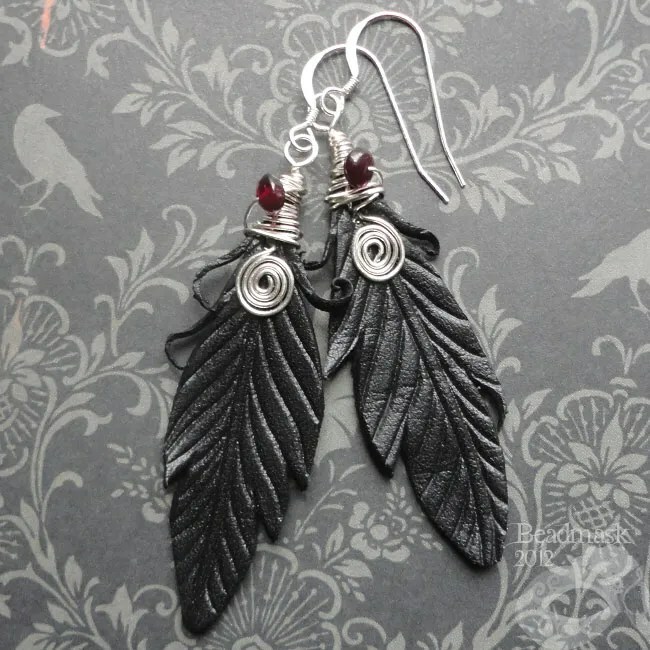 There were several styles of leaves, and of course, lots of feathers — especially raven feathers (if you scroll through this blog, you may notice that I have a thing for corvids ;). 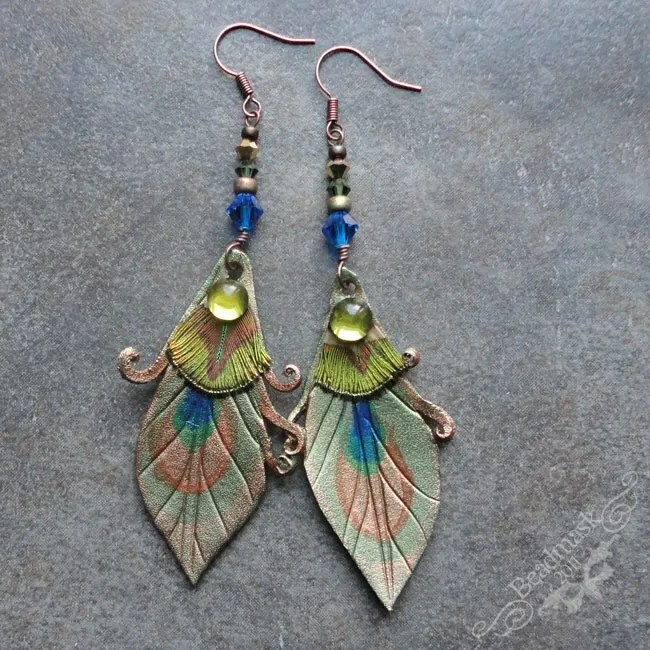 These were accented with mixed metal wire, Swarovski crystals, and assorted gem stones. I debated whether or not to add real feathers. When I created their facebook photo album, I asked my fans if they were “Good, Bad or Ugly?” — which hints at how unsure I was about the style. They were well received, and I kept playing with the designs. These were somewhat tricky at first because I’d never really done such small leather projects. They’re simple enough to make, but working with leather at this scale was new and challenging for me; in addition, I’ve never been much of a wireworker. There are people who can do amazing things with wire, but I am not one of them. My knowledge and experience with that type of jewelry design is limited to the most basic skills. I’ve continued to play with this style over time, and I suspect that I’ll continue to do so. They’re admittedly simple designs, but I think the little projects tend to be the ones that build your skills the most (see this earlier post on formative work). There are many artisans who claim that every single piece they make is a one of a kind design. That is admirable — though I always wonder if they are actually selling their work as a substantial portion of their income. As a working artist, it seems like it would be incredibly challenging not to repeat designs, and still create enough to support oneself. But I’m getting off track — my point is that I actually find value in revisiting designs. It helps me to hone my skills and also gives me a yardstick for progress. The current variations are still not exactly what I saw in my mind’s eye when I began making these; I hope there will be more permutations as time goes on. Still, it’s nice to contrast then and now. I often get restless or frustrated because my “creative vision” is usually far ahead of my actual skills. This is probably a good thing in that it keeps me striving — but sometimes it leads to feeling impatient or being hard on myself. When I can stop long enough to notice progress, it motivates me to keep exploring. I purchased these shimmering green elytra early last year, not entirely sure if I’d be able to use them. They’re incredibly beautiful, but the whole “dead bug” aspect kinda squicks me out a bit — and yes, I do appreciate the irony of that statement, considering that I often play with dead things (leather, feathers, bones). It didn’t take long to overcome my aversion to bugs, though. These beetle wings are absolutely stunning and they’ve been calling to me for months. Ultimately, time was my biggest hurdle in working with these. I found myself so consumed with deadlines and custom orders, that I never really had free time to explore my ideas for these new and exciting materials. Fortunately, I did carve out a little bit of time at the end of the year just to make something that I wanted to — and it felt great! These earrings are the result. I am currently working on a collar to match — will post photos when it’s completed.